tion, and neuroscience, have weighed in on this topic, some with plausible explanations. But it seems to me that most experts offer only partial explanations. For instance, brain researchers provide ample scientific data explaining how the human brain functions. Brain scans reveal that specific areas of the brain reflect noticeable characteristics that relate to human behaviors. Some recent findings show that brains of progressives and conservatives differ physiologically. The typical conservative brain contains a larger right amygdala, the deeper brain structure that processes emotional information, such as fear and anger. In contrast, progressives tend to feature a larger anterior cingulate gyrus, the area responsible for absorbing and influencing new information when making decisions or choices. For more information, see: Experts Say Liberal And Conservative Brains Are Wired Differently. What this progressive-versus-conservative brain research fails to address is how our malleable brains can change over time, simply by means of consistent, beneficial nurturing. Examples exist of certain mono-cultural ethnic groups in which all citizens exhibit similar beliefs and behaviors, for example, the way strongly religious-oriented cultures compare in relation to secular-oriented cultures. Studies show that education and learning can change the brain, as much has been written about brain plasticity in recent years, including this article: Neuroplasticity: Learning Physically Changes the Brain. Space is limited, so I’ll jump to the main point I wish to stress: People evolve throughout life, or at least they would, and could, if they were nurtured appropriately—in a loving, life-affirming manner that encourages curiosity in exploring wide-ranging beliefs and behaviors. Growing up in the “Silent Generation” (WWII, ‘50s), I’ve come to realize that the unique life path I’ve taken helped stimulate an expansion of thought processes. For instance, as a truth-seeking philosophy major in undergraduate school, I thought I was headed for service as a Methodist minister or church musician. In completing a music major, however, music mentors convinced me to pursue my vocal music interests. Following this advice, I gradually assumed a lifelong career as a singer-teacher, which provided plentiful opportunities for exploring a wide range of challenging life experiences. Eventually, upon retirement a decade ago, I resumed cultivating a profound interest in sustainability issues. In sum, I’m convinced that the wide range of learning challenges I’ve dealt with over time have altered my brain, making it possible to think more holistically, and integrally. If you haven’t heard of Spiral Dynamics, a brief overview of human development should be helpful. The premise of this view is simple: people evolve, and in so doing, they move through a particular sequence of stages, a sequence that has been long studied by Western psychologists and has been found to be essentially universal to every culture in the world. 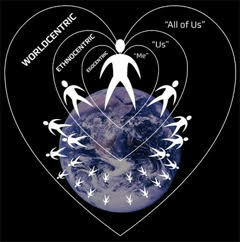 (For more information, see: Spiral Dynamics – A Way of Understanding Human Development. A developmental view accounts for the “multiple intelligences” every human being possesses, including cognitive development and native intelligence, values and beliefs, charisma and interpersonal skills, and so on. There’s a long list of various intelligences, each proceeding along its unique developmental track, but there is enough similarity in their overall development that we can take a “big picture” view of our growth and development by using a very simple concept known as “Altitude”, essentially a barometer of overall human growth, each stage of which has slowly evolved over the course of human history, and is still in effect today. Also, a correlative aspect of human development is evolving consciousness, which may be thought of as expanding awareness (understanding) of everything experienced—visually, aurally, kinesthetically, and cognitively. In simple terms, the stages are: 1) Egocentric, as represented by young children, who are motivated primarily by basic “ME” needs and emotions; 2) Ethnocentric, as represented by older children and teens with a “my-group” orientation (most adults are stuck at this socio-cultural-religious “US” level, in thought and behavior); 3) Worldcentric, as represented by well-educated, more highly evolved adults who rely more on critical, rational thinking (like most sustainability folk; “ALL OF US”); and, lastly, 4) Cosmocentric, as represented by a minor group of highly enlightened, “Big-Picture” thinking individuals who welcome and promote inclusivity of ideas and realities (consider Dalai Lama and Pope Francis). The following illustration depicts the first three levels or stages. It’s very important to realize that, regardless of the system used to categorize and explain human development, the reality is that most individuals exhibit all levels at various times in life. For instance, we’re all capable of moving through a wide range of emotions when reacting to certain life challenges, as when losing our temper and reacting irrationally (egocentric, ethnocentric). But, after cooling down and reflecting on the causative problem, we may rely on more on our adult ability to reason, to understand, to apologize, or to forgive (worldcentric, cosmocentric). I think one of our species most common maladies is “arrested development”, the tendency to stop evolving at a certain developmental level or stage. Most people seem to be arrested at the adolescent stage, especially when it comes to forming a comprehensive, in-depth worldview. This is a very complicated topic that needs in-depth discussion, but I think I’ve proffered enough information to stimulate your thought processes. Go to it! > Resource Insights: OPEC Production Cut: Just Another Head Fake? (Kurt Cobb). The main thing that the Kingdom of Saudi Arabia has done over the past year in response to pressure from other OPEC members is talk about steps it would take to raise oil prices. But in the end the kingdom doesn’t actually do them, or it does things that have no practical significance. We should keep all this in mind when evaluating the latest reports that OPEC has agreed to cuts. One of Saudi Arabia’s partners in its yearlong public talkfest has been Russia, the number one or number-two oil producer in the world, depending on what month it is. By making periodic announcements about cuts and freezes followed by rumors or statements that undermine the original announcements, they are creating the requisite uncertainty. I believe the kingdom is merely giving everyone another head fake just as they and the Russians (and now the Algerians) have been doing all year. > Degrowth: Adultum – A Critical Narrative At The End Of Growth And A Name For The Coming Age (Josef Senft). Degrowth can be translated in German as “ausgewachsen” (grown up, which captures two aspects: the end of growth and entry into a stage of maturity, namely adulthood. Adults are expected to show increased maturity and responsibility for themselves and others. Because the prevailing production methods and lifestyles of industrialized societies overburden the ecological capacity of the earth, the transition from quantitative to qualitative growth in terms of social relations, values and wellbeing is widely demanded. The term “Adultum” may also be used to describe an era of “adult idealism”, a mindset that helps in facing future challenges courageously, instead of alarmism or resignation. An “adult narrative” encourages us to participate in a civil society that pushes democratically for more sustainable and socially just conditions for all future generations. > P2P Foundation: Commons: A Frame For Thinking Beyond Growth (Silke Helfrich, interview). To understand the meaning of commons requires knowing who creates them, cares for them, protects them, and reproduces them. One cannot think about the commons without thinking about the notion of community, ranging from intentional communities and small face-to-face communities to global networks, or even huge, loosely connected networks of communities. Also, commons are not automatically managed in a sustainable way, although research shows that community forests or fisheries may be more sustainable when managed as commons, in contrast to privately managed examples. A third important point is that, even if imperfect, commons-based solutions are more down-to earth and more bottom-up than the ordinary management of resources. This also means that they are more democratic than solutions dependent on decisions partaken by external entities. > ABC NEWS: Why It Matters: Energy (Matthew Daly). THE ISSUE: Energy independence has been a goal of every president since Richard Nixon. Hillary Clinton and Donald Trump have very different ways to achieve it. How energy is produced and where it comes from affect jobs, the economy and the environment. While Clinton proposed promoting renewable energy and reducing U.S. oil consumption, Trump vows “to unleash American energy,” allowing unfettered production of oil, coal, natural gas and other sources to push the U.S. toward energy independence and create jobs. These conflicting energy-related political views matter because creating energy sustainability and addressing climate change concerns will require conserving existing resources, as well as moving forward with renewable energy projects. > Weathering The Storm: Happy 5th Anniversary (R. Michael Conley, Interview). On this 5th anniversary of Weathering the Storm LLC, founder R. Michael Conley provides a candid assessment of results to date and an overview of significant new global developments that are reshaping his views on the perfect storm. He will also update readers on his latest project and future plans. Conley begins by explaining why he formed WTS: “I’ve been concerned for many years about the intergenerational challenges we are facing and the mess we’re leaving for those following us. The enormity of the problem, and the lack of long term planning or any sense of urgency to address it had me gasping. It’s a story that needs to be told, and I formed WTS as a vehicle for telling it. > The Archdruid Report: An Afternoon In Early Autumn (John Michael Greer). Greer uses the metaphor of a single year to map the complete past and future existence of life on Earth. Beginning approximately 3.7 billion years ago, when the first living thing emerged, to the projected extinction of the sun—and earth—around 1.2 billions years from now, a total lifespan of our planetary biosphere rounds out at about 5 billion years. When framing these timespans within the scope of a single year, Greer estimates that humans evolved in a 2-hour period on Sept. 26. Within this grand-scope timespan, a single human life lasts fewer that 32 seconds, similar to a Mayfly in present times. Assuming humans, as a vertebrates genus, lasts around 10 million years, we humans have plenty of time to adjust and evolve into more enlightened species. But will we? This topic, which deals with “deep time” as well as deep thinking, might be addressed in the next issue. > Peak Prosperity: Part 1: What Triggers Collapse? (Charles Hugh Smith). All prediction is based on extrapolating current trends. If we expect ‘more of the same’, it’s not too difficult to make predictions about the near future. But history is not always simply more of the same. Suppose we are in the midst of an era that is as monumental as the first Industrial Revolution or the fall of Rome. Suppose we’re in an era that will compress a century of transformation into the ten years from 2017 to 2026. In this scenario, those who get it right will be riding the disruptive wave that is crushing everyone who blithely expected ‘more of the same’. It is especially challenging to forecast the outcome of crises that break the status quo and establish a new social/economic order. I have long argued that our current mode of production is fundamentally neofeudal, meaning that the few at the top of the power/wealth pyramid benefit at the expense of the many, as the entire system is structured to create and protect privilege, which I define as unearned wealth, power and benefits. > Our Finite World: Why Energy Prices Are Ultimately Headed Lower (Gail Tverberg). On a worldwide basis, it takes energy to make the economy grow. The amount of a given energy product (whether oil, coal, natural gas, or uranium) depends to a significant extent on the price available. Lower and lower efficiency in extracting energy is sometimes referred to as diminishing returns. When workers’ wages don’t rise, they must cut back on purchases, and when their wages don’t rise, the result tends to be recession. Essentially, the economy is a dissipative structure. As it grows, it needs an increasing amount of energy to operate. If the energy is not available, it becomes increasingly subject to collapse. (See The Physics of Energy and the Economy). At some point, we can expect to reach a Minsky Moment. The price of oil will likely not rise very high for very long. Our oil-price problem is part of a much larger problem—a slowing economy with low prices for most commodities, including oil. > Climate Central: Oil, Gas And Cows Culprits In Methane Spike, Study Says (Bobby Magill). The study shows that even though fossil fuels development has polluted the atmosphere with up to 60 percent more methane than scientists previously thought, the main culprits behind the rise in global methane levels are wetlands, landfills, rice fields and belching cows. Methane is about 34 times as potent as carbon dioxide in warming the climate over the span of a century. Global methane emissions have risen and fallen since the 1980s, but have been rising steadily for the last nine years. They found that biological sources such as cattle, landfills and agriculture account for up to 67 percent of total human-caused methane emissions. Research has also shown that thawing Arctic permafrost is a major source of methane emissions. > Climate Signals: Hurricane Matthew – 2016 (Staff). After a catastrophic landing in Haiti, and then soaking Florida, Hurricane Matthew made landfall on the southeast coast of the United States on October 8, unleashing record-breaking rainfall and storm surge and driving historic flooding and destructive winds along the coasts of Florida, Georgia, the Carolinas, and Virginia. Matthew set records for storm tide at multiple locations along the Southeastern United States, aided by sea level rise, which significantly extended the reach of the storm surge. Record breaking rainfall was fueled in part by record-breaking levels of atmospheric moisture above the Southeastern U.S., reflecting the process by which climate change drives extreme precipitation. As global temperature increases, the capacity of the atmosphere to hold and dump more water grows. At the same time warming of the oceans increases evaporation, making more moisture available to the atmosphere. > Climate Central: Record Warmth Helps Shrink U.S. Carbon Emissions (Bobby Magill). Energy related carbon dioxide emissions hit their lowest point since 1991 during the first six months of 2016 because of mild weather, declining coal use and increased use of wind, solar and hydropower. By the end of the year, 2016 is expected to see the lowest level of energy related carbon emissions of any full year since 1992, according to the report, released Wednesday. > Portland Press Herald: Cost Of Winter Heating May Send Chills Up Your Spine (David Koenig). The Energy Department said Thursday that household bills are likely to be higher for all four main heating fuels—natural gas, electricity, heating oil and propane. Here is the Energy Department forecast for average household heating bills from October through March: Natural gas—up 22 percent, or $116, to $635 on a national average; Heating oil—up 38 percent, or $378, to an average $1,370; Electricity—up 5 percent, or $49, to $945 because of higher consumption; and Propane—lower than most years, but higher than last winter, when temperatures were mild and prices low. Unaccounted costs for using wood and wood pellets, which are used to heat about 2.5 million U.S. homes, including one-fifth of rural households in New England. Overall costs will vary by regions, with the Northeast and Midwest energy costs likely running higher. > Carbon Brief: Climate Change Could Push Risk Of ‘Megadrought’ To 99% In American Southwest (Robert McSweeney). Combined with a decline in rainfall, global warming conditions could put risk levels at 99% for a megadrought in much of the southwest region, while moderate increases in rainfall would still leave risk levels above 70%. But there is a “glimmer of hope”, as the study also shows that keeping global temperature rise to no more than 2C above pre-industrial levels would cut this risk by half. A new study, published in Science Advances, says unchecked climate change is upping the risk that California and the wider American southwest could see longer future droughts. The researchers assessed future drought risk using a statistical model to estimate the impacts of temperature and rainfall changes on soil moisture in the southwest, a region that includes Arizona, much of California and Nevada, southern Utah and western parts of Colorado and New Mexico. > Huffington Post: Most Farmers Still Doubt They Have Anything To Do With Climate Change (Josepth Erbentraut). Hurricane Matthew is just one of many extreme weather events that has had a tremendous effect on U.S. farmers’ operations this year, including: the worst drought in the Northeast in a decade; historic flooding in southeast Louisiana; and an ongoing 6-year drought in California. While no one weather event can be directly tied to climate change, an increasing number of scientists are describing a link between our warming planet and extreme weather like droughts and floods. Minimal research shows that most farmers would probably not agree that man-made climate change is responsible, even though their industry is both uniquely vulnerable to extreme weather and a significant source of climate change-causing greenhouse gases. > The Guardian: Central America’s Rampant Violence Fuels An Invisible Refugee Crisis (Nina Lakhani). As huge numbers of Syrian and African refugees risk their lives crossing the Mediterranean Sea to escape war-torn states, a parallel refugee crisis has unfolded on America’s doorstep amid an undeclared but increasingly brutal war between criminal groups and security forces. An estimated 80,000 people from El Salvador, Guatemala and Honduras, mostly families and unaccompanied children, are expected to apply for asylum overseas this year—a 658% increase since 2011, according to the UN refugee agency (UNHCR). Tens of thousands more will be forcibly displaced, but not seek international help. More than 100,000 families and unaccompanied children from Honduras, El Salvador and Guatemala were detained at the US southern border in the past year. > Inequality: Our Billionaire Age Still Going Strong (Sam Pizzigati). Former Census Bureau statisticians now with Sentier Research released new figures this week that compare the 2014 wages of white male high school grads to the wages of these same workers in 1996. In 1996, white high school grads (ages 25 to 44) averaged $40,362 in earnings. in 2014 these same school grads—now ages 43 to 62 —averaged $36,787, after adjusting for inflation. As for blacks, an Economic Policy Institute study last month found the black-white wage gap actually growing. America’s super rich, by contrast, have been doing splendidly. Since 1982, our 400 wealthiest have, in effect, well more than quadrupled their wealth, after taking inflation into account. Average Americans have essentially spent those same years running economically in place, working more productively than ever before without having much of anything to show for their labor. Inequality in America remains alive and well. > Circle Of Blue: EPA Announces National Wastewater Nutrient Population Census (Brett Walton). The U.S. Environmental Protection Agency calls nutrient pollution the “single greatest challenge to our nation’s water quality.” Rising concentrations of nitrogen and phosphorus in waterways, the agency reports, are a significant threat to human health, ecosystems, and local economies. Nutrient pollution has reached an alarming intensity in many of the nation’s waterways. More than 40 percent of lakes, rivers, and streams, according to the EPA, have concerning levels of phosphorus. Mats of green muck in the St. Lucie estuary earlier this summer prompted Florida Gov. Rick Scott to declare a state of emergency in four coastal counties. As of mid-August, authorities across the country had issued more than 250 health advisories this year for toxic algae. A warming climate adds another degree of difficulty. > Minnpost: Globalization Is Bringing Little Change In What We’re Eating—Or Growing (Ron Meador). Despite the great variety of produce found in grocery markets, a closer look at the general patterns of what farmers have been growing, and people eating, since 1992 finds far less change than economics would predict. This is especially so if one focuses, as this University of Minnesota study did, on the gaps in wealth, consumption and food production that divide the world’s temperate zones from its tropics. In brief, the ability to buy and sell food freely in a global marketplace ought to narrow the range of agriculture products flowing out of a country, and broaden the range of goods flowing in. > Reuters: Nearly 200 Nations Agree Binding Deal To Cut Greenhouse Gases (Clement Uwiringiyimana). On Saturday in Kigali, Rwanda, nearly 200 nations have agreed a legally binding deal to cut back on greenhouse gases used in refrigerators and air conditioners, a major move against climate change.The deal, which includes the the United States and China, divides countries into three groups with different deadlines to reduce the use of factory-made hydrofluorocarbon (HFC) gases, which can be 10,000 times more powerful than carbon dioxide as greenhouse gases. Under the pact, developed nations, including much of Europe and the United States, commit to reducing their use of the gases incrementally, starting with a 10 percent cut by 2019 and reaching 85 percent by 2036. Unlike the Paris agreement, the Kigali deal is legally binding, has very specific timetables, and has an agreement by rich countries to help poor countries adapt their technology. > Common Dreams: The ‘Good Anthropocene’: Grassroots Initiatives Worldwide Show Path Forward (Andrea Germanos). Looking for a ray of sunshine amidst seemingly endless news of the warming planet, global biodiversity loss, or ongoing war? You might want to head over to Seeds of a Good Anthropocene, a website developed by a team of international researchers to spotlight global initiatives or “seeds” from the grassroots that help pave the path towards a more just, sustainable world. Researchers analyzed 100 of the roughly 500 efforts submitted to the site, and published in the journal Frontiers in Ecology and the Environment what they identified as six overarching themes under which the initiatives fall: agroecology, green urbanism, future knowledge, urban transformation, fair futures, and sustainable futures. > Shareable: Voting With Every Dollar We Spend: Business Models That Build Community Resilience (Transition US). We can choose to support businesses that make our communities more resilient rather than extracting local wealth and resources. Sometimes it costs more to support businesses that are aligned with values of social and ecological responsibility, but those prices reflect the true cost of production. When purchasing cheap consumer goods, the true cost of production is often passed on to workers and to future generations. When we shop at chains or big-box stores, much of the money we spend leaves our community, but when we shop at local, independent businesses, our money is recycled locally and strengthens our local economies. In this new report by Transition US, “25 Enterprises that Build Resilience,” we look at twenty-five businesses across the US that actually build community wealth and resilience. Download the report. > Washington Post: Stop Raking Your Leaves! (Christopher Ingraham). According to Sam Bauer, a turf grass researcher at the University of Minnesota, the best thing to do with your leaves may be to forget about raking and bagging, and simply go over them with a lawnmower from time to time. “The leaves have organic matter in them, you’re adding good organic matter to your soil when you’re not picking them up,” Bauer said in an interview. You can just run the leaves over with your regular mower, with a closed side discharge outlet, or buy a specialized mulching blade for your mower that’ll chop leaves up even more finely. The benefits to your lawn are two-fold. All the organic material adds good nutrients to your soil, which will help your grass grow better next year, and it also suppresses weeds. > Resilience: The Renewable Energy And Waste Industries: 21st Century In Changing The Global Economy (Jeremy Leggett). The emissions prizes of both a renewable economy and a circular economy are huge. The Paris Agreement is essentially a charter for the decarbonisation of energy industries, to be achieved as soon as humanly possible. This explains why so many cities and corporations have taken on 100% renewables targets. Meanwhile, adopting a circular economy could involve 70% cuts in carbon emissions by 2030, according to a recent Club of Rome study of five European economies. Modeling a mix of renewable energy, energy efficiency and material efficiency strategies, the study finds that GNP would grow by c.1.5% across the nations studied, and more than 100,000 additional jobs would be created, cutting unemployment by one third. The future can be both renewable, and circular—sooner than many think. > Yes! Magazine: 6 Ways To Make Our Money Bring Us More Happiness (Kira M. Newman). For those of us lucky enough to have disposable income, what if we defined wise spending in terms of the happiness that it brings? That’s a completely different way of thinking about our purchases, and one in which we have little practice. More than a decade of research has been investigating how different types of purchases affect our wellbeing, and it can help us turn spending into a happiness practice in its own right. The key, it seems, is to spend money in ways that bring you closer to other people, including spending money on: 1) experiences; 2) sharing experiences with others; 3) other people; 4) the right people (close friends and family members); 5) expressing your identity (charities, causes, hobbies); and, finally 6) think less about spending and spend less. > New York Times: How Did Walmart Get Cleaner Stores And Higher Sales? It Paid People More (Neil Irwin). To fix increasing customer satisfaction with Walmart stores, executives came up with what counted as a revolutionary idea for Walmart. As an efficient, multinational selling machine, the company had a reputation for treating employee pay as a cost to be minimized. But in early 2015, Walmart announced it would actually pay its workers more. The results are promising. By early 2016, the proportion of stores hitting their targeted customer-service ratings had rebounded to 75 percent. Sales are rising again. That said, the immediate impact on earnings and the company’s stock price has been less rosy.